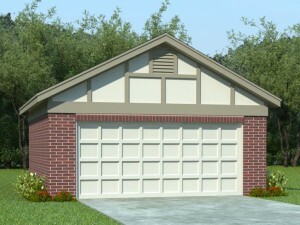 Currently, there is a growing trend among those wishing to build a garage. Many are opting for garage apartment plans. These floor plans incorporate a fully functional living space with the garage either on the same level or above the garage. Garage apartment plans range from a parking area with a studio apartment to a one to three bedroom layout. They include at least one full bath and a modest kitchen in most cases. Some even include special extras such as a fireplace, walk-in closet, laundry facilities or organizational built-ins. So, why are people choosing garage apartment plans? Below is a list of some of the top reasons for their popularity. 1. Guest or In-Law Suite – Many families enjoy out-of-town guests, overnight visitors and weekend visits from family and friends. A garage apartment provides guests with privacy and comfort. 2. Added Value – A garage apartment contributes street appeal and adds functionality and value to your property. It is a great way to complement your home and gain usable space. 3. Home Office – Many working Americans run home-based businesses. The apartment easily converts to an office and meeting area providing a space to work or meet with clients without disturbing the main home. 4. Work Space – For those who enjoy hobbies, the living area of a garage apartment plan comes in handy for use as a hobby room, craft area, etc. The living area can easily serve as a work space for all your projects, and you having to clear off the dining room table every evening for dinner. Plus, you’ll always have an extra bedroom and bath when visitors drop by. 5. Weekend Retreat/Secondary Residence – For those who like to get away from it all, a garage apartment is the ideal alternative to a vacation home. 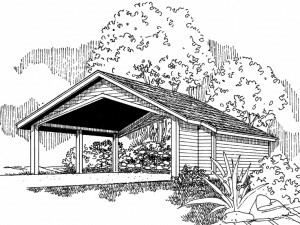 Use the garage for storage of outdoor sporting gear, a boat, ATV, bikes, etc. The apartment will give you a great place to kick back and relax after a fun day on the lake or hunting expedition. Some designs have multiple bedrooms offering plenty of room to bring a couple of friends along for a fun and relaxing weekend. 6. Income – If you are in need of garage space, but can’t quite afford a new garage, consider a garage apartment plan. You can use the garage space as you wish and rent out the living quarters earning income that will help you pay for the garage. Once the garage is paid for, you’ll be making money off your garage apartment. Also, most maintenance expenses are tax deductible. 7. Multi-purpose Space – Sometimes families need a flexible space that can accommodate many different needs. Consider a garage apartment with an open floor plan. The open living space can serve as an entertainment area for family and friends such as a recreation room, game room, home theater and more. Or it can be a game room tonight and convert to a meeting space for your wife’s scrap-booking club tomorrow. Possibilities are endless with an open floor plan. As you family grows and changes, you can adapt the living space to satisfy your needs. If you are considering building a new garage, take time to think about the additional value and possibilities of choosing a garage apartment plan. 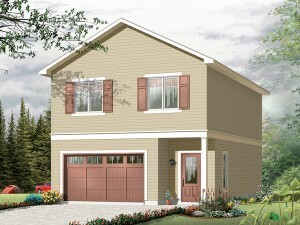 Browse garage apartment plans at The Garage Plan Shop. Security for a detached garage plan is often overlooked, but it is important to note that a detached garage is a great target for vandals and thieves. Whether you actually store your cars in your detached garage or not, it is very likely your garage holds plenty of other expensive tools and equipment that may be of interest to potential burglars. Below are eight tips to help you keep your detached garage and everything inside it safe and secure. 1. Make sure your garage door is in good working condition. Check the garage door for cracks, loose panels, broken window panes and other damaged areas. Have the garage door repaired or replaced as soon as possible before a criminal discovers these weak points and pries the garage door open. 2. Lock doors and windows when you are not in the garage. Having quality locks on all doors and windows will deter potential break-ins. 3. Lock the garage door from the inside. Criminals are getting smarter. Even with a quality garage door opener, criminals can still get in your garage by rolling the door up with a little effort. If your garage door has locks, use them. 4. Never leave your garage door open if it isn’t necessary, even if you are home. An open garage door easily displays your garage and all the contents inside to anyone traveling along your street so they know what valuables you have inside. A passer-by might see something he or she wants, such as a new bike or your prized motorcycle, and come back to steal it. Keeping the garage door closed also deters vandals. If someone looking to “have a good time” spots your sparkling ski boat or a restored vehicle in the garage, the open garage door just gave them an invitation to come back later and ransack the garage and damage your valuable possessions inside. 5. Do not leave the garage door cracked for ventilation. Even the slightest crack at the bottom of the garage door provides an opportunity for break-ins. 6. Use outdoor lighting and security cameras to deter criminals and thieves. Burglars know most detached garages are unoccupied at night. Since the detached garage is not connected to the home, it is easy to break-in and not be noticed. Lighting and security cameras will make potential burglars think twice. 7. Stealing garage door openers out of cars is becoming a growing problem. Keep your call locked at all times even if you are in the house or the backyard. If you discover your garage door opener has been taken from your car change the frequency and code to your garage door opener immediately. 8. If you have a home security system for your home, consider adding the security system to you detached garage as well. Homeowners often overlook the security of their detached garage. Following these tips from The Garage Plan Shop will help make your garage and the things inside it safe and secure.